I have been eager for Liz Johnson to start writing a new series as I loved her Prince Edward Island Dreams series! "A Sparkle of Silver" is the first book in her new Georgia Coast Romance series and it starts the series off with mystery, romance, revisiting the past and family relationships. Millie plays the role of a 1920's era guest at the Chateau; however she has a motive for playing this role besides the fact of it being a job for her. Millie's Grandma Joy requires much care and she has shared about a journal and her mother being a guest at the Chateau along with a hidden treasure. Millie is determined to uncover the secrets and treasure to help answer the questions as to who really is a part of her lineage, but also that her family receives what is rightfully theirs. However, Millie's searching is discovered by Ben whom is a security guard on the grounds, which he does for his own reasons. As these two team up to search for the treasure and discover what really happened during this summer from so many decades ago, there is much they learn about themselves, their pasts and their future. This is a great story! It is a nice mix of mystery and romance and I absolutely loved the characters. I love the whole dressing up and playing the roles to set the scene at this place as a part of recreating history. Liz's writing is so descriptive, it was easy to picture the various scenes and become a part of the story! I am looking forward to book #2! I have been waiting for "Lethal Target" to come out since I finished reading the first book in this series, "Crisis Shot!" The wait was worth it for sure, but now I am left wanting more! Tess addressed the issue of the drug issue in their small town last year. However, she realizes that this issue may not be completely over and she may be facing a bigger problem. Even though Rogue Hollow is a small town, there is so much going on here, things that affect and impact the community as a whole and personal issues that spill over into others around the individuals as well. However, this is just like it is in real life and it makes the book and characters that much more relatable for the reader. Janice Cantore has a knack for telling stories that are timely for today's society and creating characters are easy to like and easy to empathize with and relate to. I immediately liked Tess in the first book and now after getting to spend more time in her story, I like her even more and feel as if I know the town and the minor characters better as well. This is a great suspense novel that is filled with twists and turns and has a sprinkling of romance mixed in as well! "Hidden Peril," book #2 in Irene Hannon's Men of Valor series is another fast-paced, intense read! First of all, be sure to read book #1 in this series, "Dangerous Illusions," first as you are introduced to the main character Kristin and her childhood friends in that and they all play roles in this one. Kristin loves her shop and the role that she plays with helping the world, this is part of the pact that she and friends made years back. However, when Kristin's employee is shot and killed in the shop and then a customer is killed, Kristin begins to believe that there is something sinister going on. Detective Luke Carter is new to the area's force, but not new to the job as he has experience in the field and recognizes signs that there is much more to the initial picture that is presented and he feels that Kristin may be in danger herself. This causes him even more concern as he realizes that he is losing his heart to this woman. Kristin and Luke met at Trish and Colin's wedding, right at this start of this book and I loved how this interaction set the stage for what was to come, as well as building upon the bond between the three characters, and how the new people in their lives are being worked into these friendships as well. I cannot wait for book #3 to see even more of this! There are so many pieces to this story, so many layers, as Kristin is dealing with unresolved issues from her childhood involving her family, and although it takes a terrifying incident to see changes in these relationships, it was very well-written and I love that even after so many years, there can be a change as evidenced with Kristin and her parents. Luke had suffered so much heartache and he has been living his life, not feeling ready to love again or capable, but yet there comes a time, a time that is God's timing and His will that he is ready for a relationship and he was able to meet Kristin and then have much more contact with her due to the case. It is scary how real life this book is, as there are terrorist attacks and plans that we hear so much about and that is the world that we currently live in. 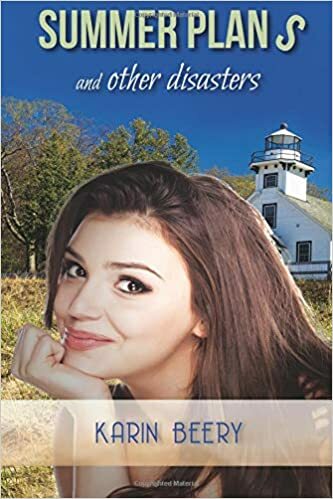 However, this should not cause our faith to be shattered or to live in fear, and not follow our hearts; these characters are all such inspiring examples of this and this is a wonderful romantic suspense book that should not be missed! If you ever wanted to know more about the Mennonite and Amish way of life, this is the book for you! Darla shares her life, a year of it, with accounts from Tuesdays that she spends with her mother, her sisters and their children. These are days that are filled with family time, a time of connecting, sharing and learning from and through each other. Each chapter spans one month and it is an account of the visits for the month, including activities, recipes, things learned through conversation and merely being together and working through things together. 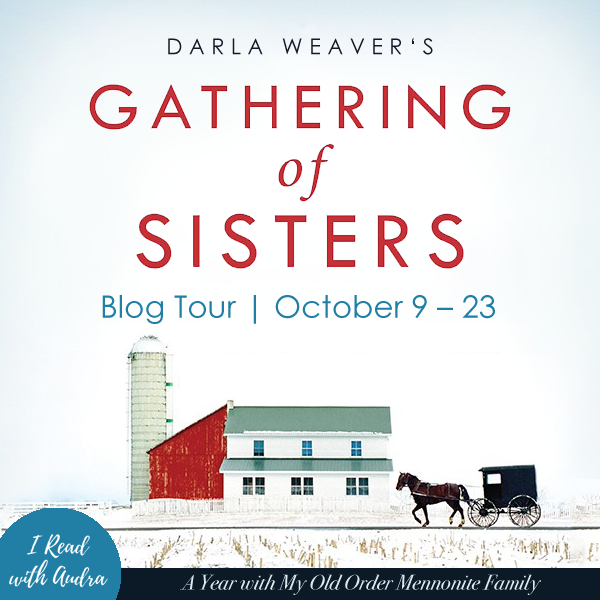 This book has such a personal feel to it as it is a personal account shared by Darla herself and it makes me wish for a day like this each week, of a time of connecting and just being a family. It is a nice break from the every day routine for these women; not that it is an actual break from work, but from the normal routine a time of reconnecting and recharging from being in each other's company. I love how their faith shines through as well through their conversations, through their interactions. This is a nice, inspiring book that will encourage you to make the most of time with your own family and carve out time specific for family such as days like this. To read an excerpt from the book, go here! then head back to the launch post on JustRead or straight to the main crossword puzzle to fill in the words and get the special phrase to enter the giveaway! Before we begin, there's a bit about Lady of a Thousand Treasures. Miss Eleanor Sheffield is a talented evaluator of antiquities, trained to know the di fference between a genuine artifact and a fraud. But with her father ’ s passing and her uncle ’ s decline into dementia, the family business is at risk. In the Victorian era, unmarried Eleanor cannot ru n Sheffield Brothers alone. The death of a longtime client, Baron Lydney, offers an unexpected compl ication when Eleanor is appointed the temporary trustee of the baron ’ s legendary collection. She must choose whether to donate the priceless treasures to a museum or allow them to pass to the baron ’ s only living son, Harry — the man who broke Eleanor ’ s heart. Eleanor distrusts the baron ’ s motives and her own ability to be unbiased regarding Harry ’ s future. Harry claims to still love her and Eleanor yearns to believe him, but his my sterious comments and actions fuel her doubts. When she learns an Italian beauty accompanied him on his return to England, her lingering hope for a future with Harry dims. With the threat of debtor ’ s prison closing in, Eleanor knows that donating the baron ’ s collection would win her favor among potential clients, saving Sheffield Brothers. But the more time she spends with Harry, the more her faith in him grows. Might Harry be worthy of his inheritance, and her heart, after all? As pressures mount and time runs out, Eleanor must decide whom she can t rust — who in her life is false or true, brass or gold — and what is meant to be treasured. After earning her first rejection at the age of thirteen, bestselling author San dra Byrd has now published fifty books. Sandra's delighted to kick off her new historical romance series with Tyndale H ouse Publishers, Victorian Ladies, with Lady of a Thousand Treasures. The three-book Victorian Ladies seri es follows her historically sound Gothic romances, Daughters of Hampshire, launched with the bestsellin g Mist of Midnight, which earned a coveted Editor's Choice award from the Historical Novel Society. The second book, Bride of a Distant Isle, has been selected by Romantic Times as a Top Pick. The thi rd in the series, A Lady in Disguise, was published in 2017. Check out her contemporary adult fic tion debut, Let Them Eat Cake, which was a Christy Award finalist, as was her first historical novel, To Die For: A Novel of Anne Boleyn. To Die For was also named a Library Journal Best Books Pick for 2011, and The Secret Keeper: A Novel of Kateryn Parr was named a Library Journal Best Books Pick for 2012. Sandra has published dozens of books for kids, tweens, and teens, including the bestselling The One Year Be-Tween You and God Devotions for Girls. She continued her work as a devo tionalist, with The One Year Home and Garden Devotions, and The One Year Experiencing God's Love Dev otional. This stop's CLUE is: you. This is an excellent book set in the Victorian era! Sandra has done an incredible job with setting the scene, really bringing that time period to life as I felt as if I was transported back in time to England. In the very first chapter the reader is introduced to the main character Eleanor and we find out that she is paying respects to a man, whom she really is not sure how to feel about, but he was a close friend of her father's and was at one point thought to be her future father-in-law. Eleanor is a fascinating character as she is very talented and trained in the art of knowing what antiques are real and what are frauds and she is tasked with keeping the family business afloat; however it is a struggle. Another struggle for Eleanor is knowing who is real and who is fake in regards to her friends, acquaintances and those whom she has business relationships with, including Harry, whom says he is still in love with her. Eleanor has so much at stake and not much time to sort things out and discover the truth. I was completely lost in this story as soon as I started to read. The descriptions are so vivid that the story and setting came to life for me and I found myself wanting to help Eleanor and was hoping she was making the right choices. This is the perfect book to read all cozy under a blanket and a hot mug of tea or coffee and get lost in. I highly recommend this for fans of historical fiction! 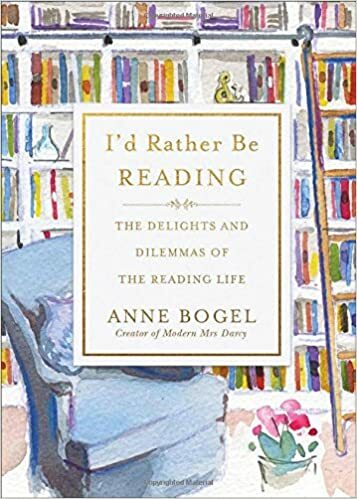 Anne Bogel's latest book, "I'd Rather Be Reading: the delights and dilemmas of the reading life," is a MUST HAVE for those whom love to read! I was so excited to see this book was coming and then when it actually arrived I was even more excited as it is an adorable book with a great cover! This is a nice sized hardcover edition, not tiny, but small enough to hold comfortably and to fit inside a purse to take with you wherever you go to read and a perfect size to display it after you are done reading! I fell in love with books at a young age and it shocks me still when I hear people saying they don't read or they don't like to read or they are not currently reading a book or when I go into a home that is empty of books. I am in agreement with Anne that books are part of life, books are a part of life, there are so many books that really spoke to me and helped me through a time, I can remember thinking so many times that the book I was reading at a certain time was exactly what I needed right then. Each chapter is wonderful in this book! So many times I was nodding and smiling in agreement with what Anne wrote. I also wrote down a few books that I have missed reading, that I want to go add to my pile to read based on something that Anne said about it. I love to discuss books, recommend books to others, and hear what others are reading and this book was such a treat, so full of book love! This would make THE perfect gift for any book lover in your life! 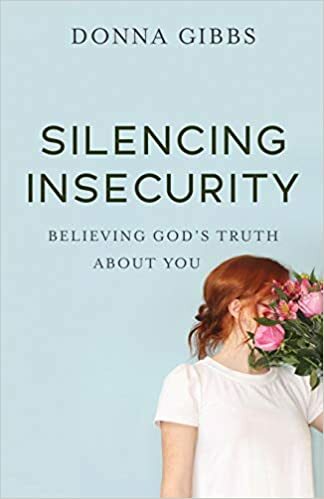 "Silencing Insecurity: believing God's truth about you," is a new personal growth book from counselor Donna Gibbs and this is one that every woman should read! This is a daily struggle, sometimes more intense than other times, and a stronger impact for some than others, however it is continual for so many people; what I'm talking about is the comparison game. Yes, we are constantly comparing ourselves, our bodies, our jobs, how we do as a mother, the neatness of our homes, everything, constantly in comparison to those around us, or pictures we see on social media. Donna shares that she has seen and heard so much of this and this is not how God intended for us to be like. In this book various things that we tell ourselves is presented and discussed and backed up with examples and then followed up with questions to ask ourselves and truths to reflect upon, all with one purpose to fight against the insecurity that has built and the lies that we have been telling ourselves and believing. My favorite chapter in the book is near the end as it wraps up so much that has already been addressed, but it takes about the formula for wholeness, how thoughts are tied to behavior and actions. Our mindset plays such a big role in our self-worth and how we see and think about ourselves. I highly recommend this book, read it and take the time to savor it and process it! 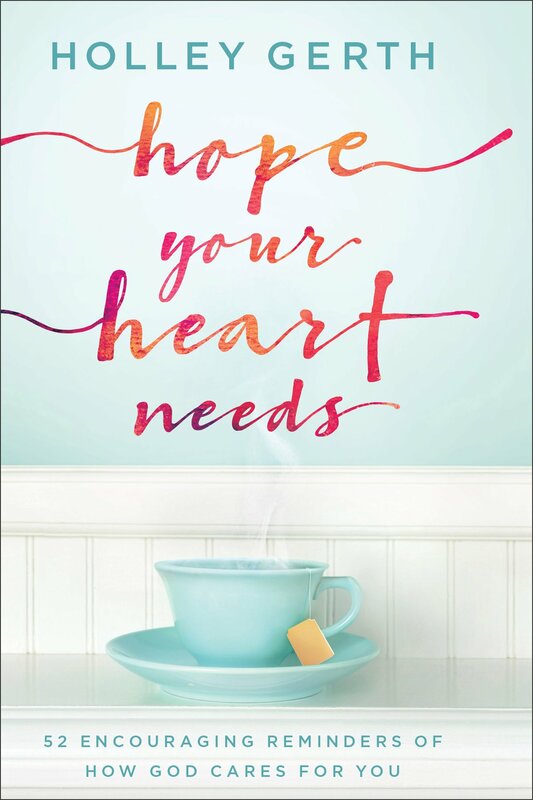 Holley Gerth is one of my favorite authors of women's living books and her latest, "Hope Your Heart Needs," is another winner. This is such a cute little book that will easily fit in your purse to pull out when you have a few minutes of down time to read and receive a little bit of extra encouragement. Although, it is little, there is so much in this book, so many reminders, 52 readings to be exact. Each reading will remind and encourage the reader that she is not alone, not traveling through this journey of life all alone, as God is right there and He cares for us and gives us strength to tackle life. These readings are a nice mixture of Holley's own personal experiences and insights, Biblical verses and accounts and quotes and readings from other books on similar subjects. I always say sitting down with one of Holley's books is like sitting down with a friend chatting over mugs of coffee, as reading is like having conversation instead of just merely sitting there reading the book. This is a great book and one that will encourage each and everyone who reads it. when do things ever really go exactly according to our plan?! Chapter 1! Here's a link where you can read the 1st chapter of this novel! This was a super cute and fun book to read! Callie has her whole summer, really her whole planned out, or so she thinks. However, as we all know, things do not always go according to plan, our plan that is, but they do go according to God's plan in our lives. Callie is moving in with her brother to help him for the summer, in more ways than one she thinks. However, Callie's brother and others, including Callie's ex-boyfriend have varying views on the situation from Callie. As Callie's plans go awry and more people get added to the mix, things become more interesting and Callie is learning that things are not going to go as she has laid out. I am hoping there are more books to follow this one, as I absolutely loved it! The characters are all so easy to love and relate to and I want to know what happens next for all of them! 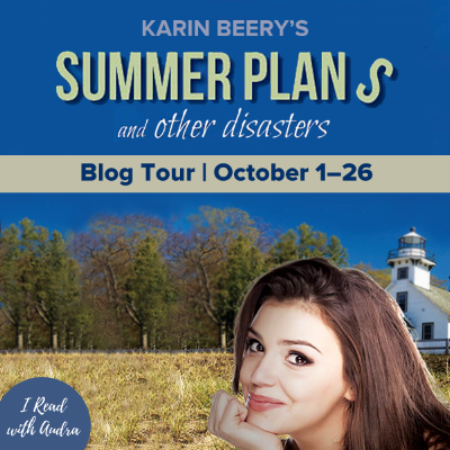 Karin writes in a style that is so easy to read and the story is told from multiple points of view which I love. This allows the reader to really get to know more of the characters and I love reading the various perspectives. I highly recommend this book and this is a new author for me to look for more books from! 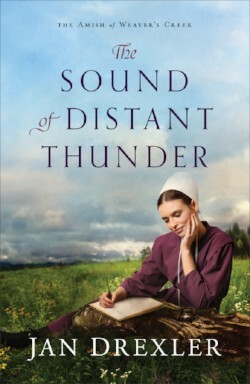 "The Sound of Distant Thunder" is book #1 in Jan Drexler's new The Amish of Weaver's Creek series. Katie and Jonas have been in love with each other and wish to marry; however they have been told to wait until they are a bit older. Although war and fighting are not acceptable in the Amish culture and they are to remain free from it and politics in general, it becomes impossible when a name is brought up in a draft. Jonas is wishing to begin his life with Katie, but he is willing to make a sacrifice and go off to war in his brother's place when his brother's name is drawn, his married and with children brother. This will turn into a test for everyone involved and a time of anxiety and hope. This is an excellent start to a new series! I have always enjoyed reading books set in the Civil War time period and this being an Amish novel adds an extra element to the story as well as war does not align with the Amish beliefs. However, war is still just as devastating to the Amish as it is to the Englishers and no matter one's background, those involved in the battles have to deal with the same worries and trials. Jan does a great job with bringing the story to life as the characters are so real and the time period and setting. It is a great mix of historical details along with fictional characters. The minor characters add so much to the story as well as the extended families are so important and their interactions and relationships with the main characters. I am looking forward to book #2!